The port of Dubrovnik is situated in the neighbourhood of Gruz, about 3 km northwest from the Old Town. This port is the departure point of all ferries connecting Dubrovnik with other ports in Croatia and the port of Bari in Italy. 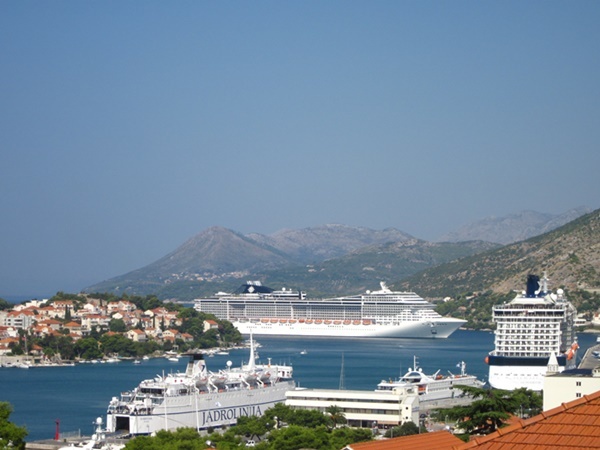 Cruise ships visiting Dubrovnik also docks at this port. From here you can take organized boat tours to the Elaphites as well as sailing tours to Split. In the Gruz area you will find tourist agencies, exchange offices, internet corner, rent-a-car offices, banks, the "Srdj" department store, "Konzum" supermarket, pharmacy, bakeries, restaurants, cafés, souvenir shops, the vegetable & fish market, Jadrolinija office (ferry and boat tickets can be purchased here) etc. The main bus station is located just outside the port area. All domestic and international buses depart from here as well as the Dubrovnik airport shuttle bus. Dubrovnik doesn't have ferry connections to any other country (Montenegro, Albania, Greece, Turkey) except Italy. Jadrolinija operates seasonal ferry from Dubrovnik to the port of Bari in Southern Italy. Tickets for all Jadrolinija's ferries and catamarans can be purchased from their office which is located close to the main pier of the port. Tickets for "Krilo" catamaran can be bought from Avansa travel agency which is located just around the corner. For those travelling by "Nona Ana" catamaran - tickets can be purchased from the small kiosk next to embarkation point. Please note that most Jadrolinija's ferry tickets can be bought also online as well as tickets for "Krilo" catamaran. FROM PLOCE: Take bus no.8 and travel until you reach the bus stop in front of the "Srdj" department store. If you are a cruise ship passenger get off the bus at main bus station. FROM OLD TOWN/PILE: Take any of the following buses: No.1A, No.1B, No.3 from Pile Gate and travel until you reach the port. FROM LAPAD/BABIN KUK: Take city bus No.7 which departs from Babin Kuk and runs through Lapad. Get off the bus at bus stop in front of the "Srdj" department store. You can also take bus No.6 and get off the bus at the bus stop close to the "Minceta" department store. In a 5 minute walk you will reach the port area. Cruise ships dock on the western section of the port. In front of the ships you will find taxis. A ride to the Old Town costs €10. If you decide to take the city bus the bus stop is located just outside the main bus station. At the main bus station you will find both an exchange office and newspaper shop from where you can buy bus tickets. The price of the bus ticket is 12 kunas (around €1.60/£1.30/$2.00). To reach Dubrovnik's Old Town take either bus no.1A, no.1B or no.3 and travel until the last stop (the Pile Gate - the western entrance to the Old Town). To reach the cable car take bus no.8 and get off at the beginning of Petra Kresimira Street (you will notice the big sign "Dubrovnik Cable car"). In case you need a multiple day parking close to the Gruz port you can park at Hotel Berkeley's private garage. The price is €20 per day. Parking can be paid in cash or by credit card.